PLEASE NOTE: I am currently adding extra links and presentations where I find them publicly available. This page may change over the next few days. 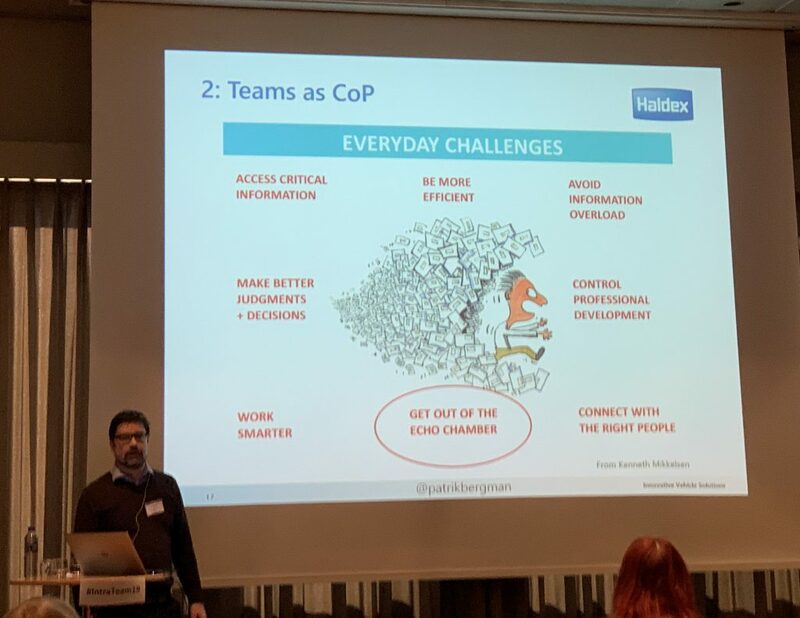 After three days of workshops and conference at the IntraTeam Event 2019 at the Radisson Blu Scandinavia Hotel in Copenhagen, I was exhausted, unable to take any more information in, several kilos heavier but, and thankfully, more energised and inspired by the potential of intranets than I’d felt in a long time. With three tracks running in parallel, almost everyone experienced their own version of the conference, and I wonder what I’d be saying had I made different choices. 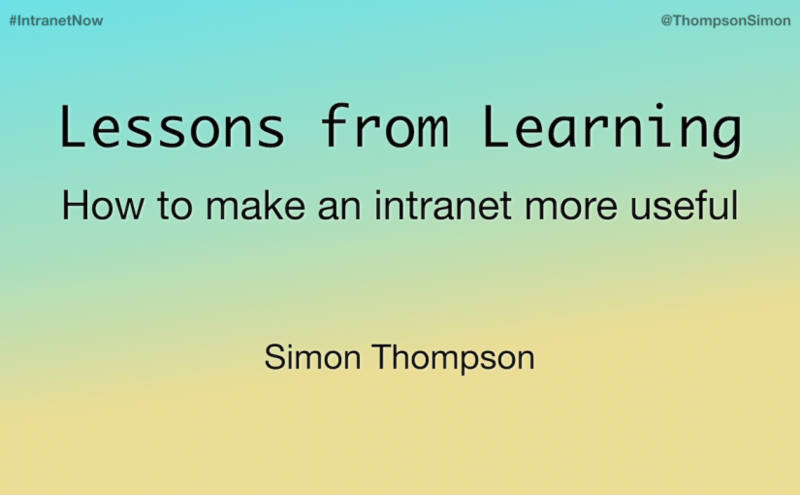 For slides and related links from my presentation please see Lessons from Learning – IntraTeam 2019. With half a mind worrying about my presentation the next day, I chose workshops that would help keep me up to date with changes in SharePoint and Microsoft 365. Christian Buckley makes three hours pass very quickly. I didn’t get any revelations about his subject Extending your IA to Microsoft Teams, but huge amounts of practical details and confirmation of themes that would recur across the three days: engage the people around you, focus on business needs, and grow based on testing and iteration. Benjamin Niaulin is another engaging speaker who can talk SharePoint for more hours than there are in a day. He guided us through what is possible with search in Office 365. I found a lot of this to be a valuable refresher, with useful clarifications coming up time and time again. I’ve been a long-time fan of what’s possible using SharePoint’s search to build content, and Benjamin gave some useful examples, and also clarified some of the challenges between using SharePoint’s Classic and Modern pages. Benjamin also covered a learning intranet tool he’d previously developed. This showed some of the potential for search-based tool to present learning materials “at the right time and at the right place based on who you are and what you’re doing“. This allowed the dynamic display of resources to people depending on their role and other profile details. After the usual introduction from Kurt Kragh Sørensen, the actual conference got off to an outstanding start. We talk about the importance of meeting real user needs, but rarely do we see such commitment or such benefits. Neil Barnett explained how the Heathrow intranet project put half of their resources into user research. I wasn’t convinced when Neil showed the personas created, and how they fell into six clear categories (Heathrow Express, Airside Operations, Baggage, Compass Centre, Security, and Engineering) but the more I think about this particular operation, it was absolutely the right way to approach things – live status updates for operations personnel are clearly essential. I will definitely consider using two of Heathrow’s user research exercises: mapping an individual’s day onto a clock helped reveal activities and pain points, while “Design your own employee app” yielded more insights into people and the way they saw the organisation. Heathrow not only built tools. Their change programme included 130 digital mentors, 15 business representatives, and an impressive 45 content authors. This content would primarily be designed for mobile use which is very heavy on brand engagement. Perhaps unsurprisingly, the staff discounts section is the most popular page. Aside from the communications and support, every employee received a new laptop plus an hour’s one-to-one training with an IT engineer to get them up to speed. I opted to see Richard Harbridge in the next session Intranets in the Cloud: What you need to know and this was another good choice. 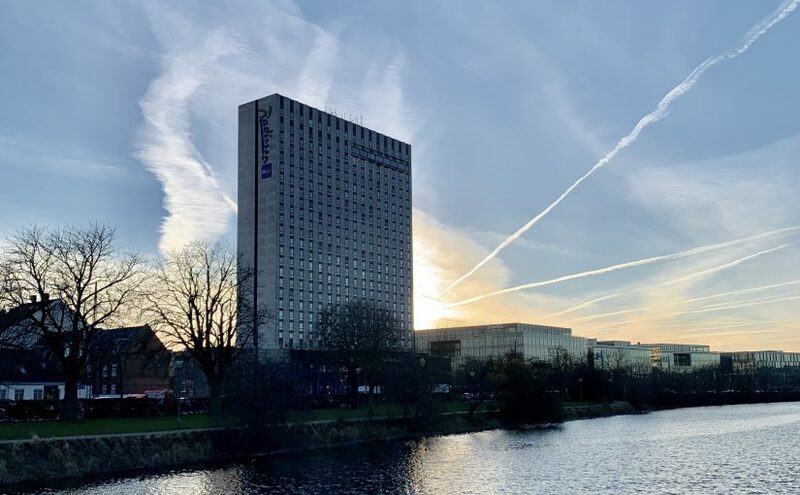 Like Benjamin and Christian on Tuesday, Richard whizzed through some of the opportunities and challenges of Microsoft 365 intranets. He was very clear that this option is a lot more cost-effective than managing your own SharePoint and servers, but could have gone deeper into the potential performance issues. He shared some advice on planning and analytics, and qualified some of the benefits to improved navigation – I particularly liked the search-based navigation. I was speaking in the following session with Lessons from Learning and had lunchtime to recover before switching back into attendee mode. Liberty Mutual’s digital assistant was a fine winner of Step Two’s IDW Platinum Award in 2018, and the company has spun-out Workgrid to sell their technology to other organisations. 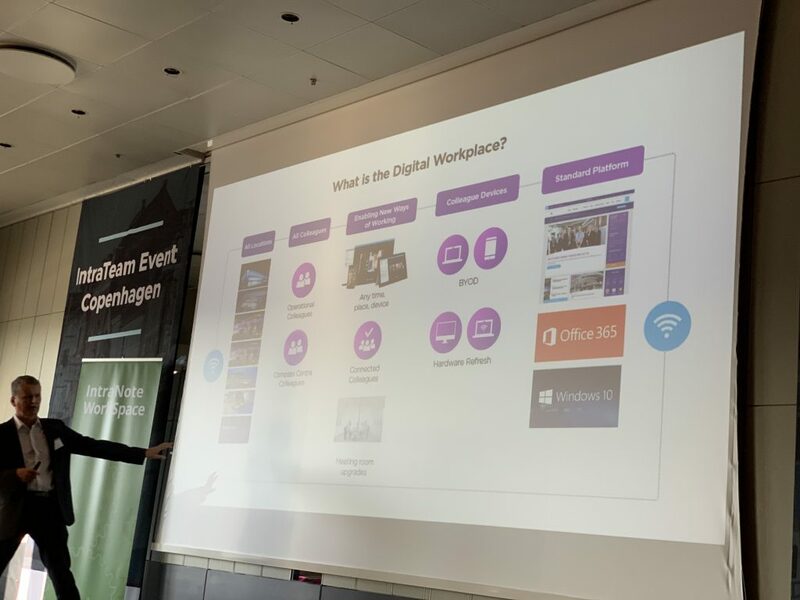 Gillian McCann spoke on the potential of AI to take us From Digital Workplace to Intelligent Workplace. For me, this was really about bringing the right information to people from numerous sources when they need it, and I think that’s exciting. I remain to be convinced by some of the promises of conversational agents for complex working processes. Patrik Bergman has been a trailblazer and proponent of learning in the digital workplace world for some time, and his writings have introduced me to a significant number of experts in learning and development. Knowledge Management in Office 365 – some concrete examples was entertaining and imbued with learning and philosophy. There was also practical advice: encourage ESN users to tag important queries with #ineedhelp is profoundly simple and valuable. The final session was the presentation for the 2019 Danish IntraTeam Prize. I wasn’t as wowed as by last year’s winner (the Danish Police intranet PolIntra), but reflecting on my notes it’s clear that Kræftens Bekæmpelse (Danish Cancer Society) is another worthy winner. Confronted with an unrealistic timeline, the team responded with a more realistic 8 months and set about simplifying, engaging, and building the foundations for a solid and practical intranet. 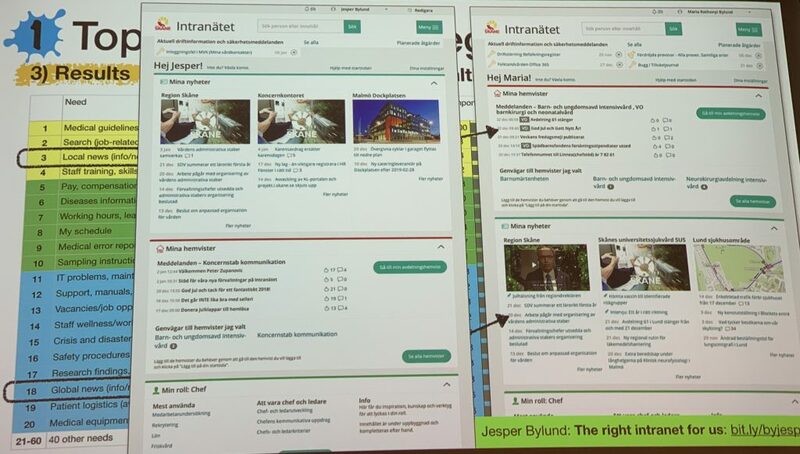 We regularly hear suggestions for prioritising content, and the team got a laugh from the audience when they revealed that of all the content classified Red, Yellow or Green, only the green content got published. There is a determination to ensure that materials are kept up to date (or archived, and then removed), while departments are given leeway to control their own content and designs. I’m not sure if it’s intentional, or whether having the Twitter name @digitalsanity has taken Elizabeth Marsh down this particular route. On Wednesday, while I was speaking, Elizabeth’s session was about mindfulness, while on Thursday she spoke on digital literacy, an area she’s been studying for some time. In So you’re transforming the digital workplace – but are your people ready? Elizabeth raised a number of statistics showing how important it is for organisations to develop employees’ digital skills but emphasised how it is a shared responsibility for staff too. What struck me most looking at Elizabeth’s Digital Skills Framework for the first time since last autumn is how much it is really about developing the learning flexibility to develop new skills as much as it is about teaching digital literacy. For Thursday, IntraTeam organised a specific track dedicated to intranet search, and this is where I spent much of the day. In Searching for people is no. 1, Kristian Norling from Region Västra Götaland in Sweden described some of the efforts possible to make people search useful to users. This brought together results from 15 sources and more than a million documents. Kristian advised us to think about needs and not, just, about hierarchy. One tiny detail that caught my eye was the ability to save a search that you do regularly, and access from an option beside the search box. Another neat detail was to allow different addresses (postal, visiting, and internal) to be displayed on user profiles. Of all the speakers, I’ve probably seen Martin White speak most often, and Eight ways to improve Search Satisfaction saw Martin at his best. He advised us of the trade-offs central to designing good search tools, that one size doesn’t fit all, and to understand the science of information retrieval. It’s hard not to like his assertion that a search team needs to have the visibility of a lighthouse. Steve Sale from AstraZeneca drew upon some of Martin and Kristian’s themes in Using Search to break the silos, find experts & provide 360 views of your organisations data. He described some of the effort required to combine large amounts of potentially useful data into a resource that helps find people and expertise, and touched upon the risks of over-enthusiastically associating potential search terms with people. Another highlight came from Jesper Bylund from Region Skåne in Sweden. His talk Top tasks, information architecture and search changed the way I think about Gerry McGovern’s Top Tasks methodology, and quite possibly personas and personalisation of content. By slicing the top tasks, Jesper has been able to design flexible page designs that meet the needs of particular groups while working. I’m also intrigued by the decision to move navigation to a fat footer, with a smaller hyperlink triggering a scroll to the bottom of the page. My final session saw Christian Buckley at his storytelling best, if not necessarily at his most to-the-point. No-one will forget Christian’s story of embarrassing his son while at high school, a blunt tale illustrating behaviour change. His third and final story will be familiar but of long-term value: the use of a whiteboard superficially as a project management tool, but ultimately as a communication and stakeholder training tool. This year’s IntraTeam was excellent, and there wasn’t a session where I didn’t feel torn between two or more different talks – it feels harsh that my biggest complaint is that I had to make some tough decisions. I don’t feel the roundtable format at lunchtime were as useful as I’d like, and it would have been nice to have a few spots for discussions with larger groups. I was saddened not to have seen Laura Rogers or Stacy Wilson speaking. I was most excited to see personas in a more practical and less dogmatic way, and what’s possible with when applied to Top Tasks analysis sliced by groups. 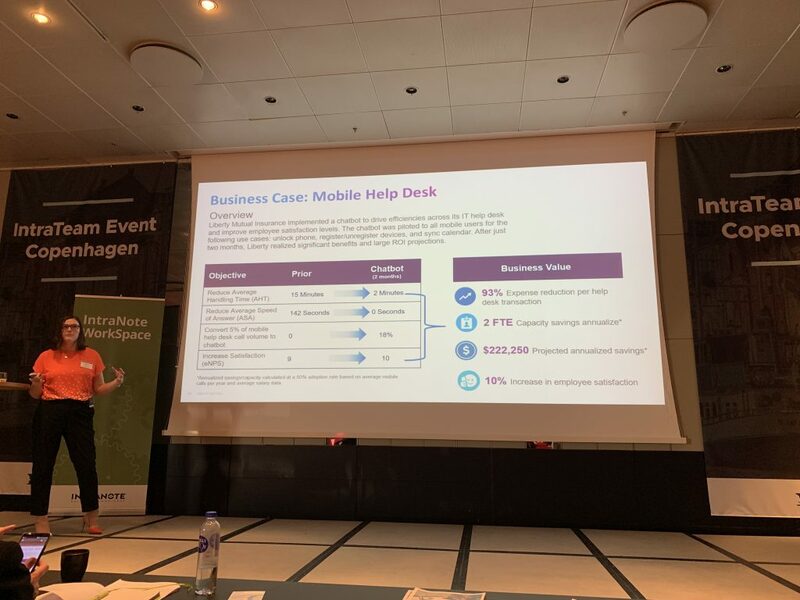 Secondly, provision of materials to mobile users has become normal now, but it was good to see a deeper understanding that mobile users need more than reformatted desktop content. Also, we’re seeing a much greater effort being put into getting content right for time, place and need, and the importance of making that content findable by search. So thank you to Kurt and his team, and to all the people who made IntraTeam 2019 such a friendly and inspiring event. Further links, reference materials, and slides will appear here. In 2015, I attended the Learning Technologies show at Olympia, London, to try to better understand what was happening in an area adjacent my world of intranets, and what could be learned to improve the already award-winning Barclays Global Curriculum project. What I found was less adjacent, and more parallel. It felt like I was in a strange parallel universe where intranets didn’t really exist. In spite of this, I learned a lot and was pleased to make it back to the exhibition after a gap of three years. Learning Technologies has moved on in that time. It is notably bigger, and there is clearly more money involved than before. There is a lot of focus on types of training, and the trendy areas are video, animation and VR, but I can’t say I noticed any mention of augmented reality. One provider I spoke to discussed putting training into a song (they’ve even used company choirs in the past), and an escape room in VR. Naturally, there are also businesses building blended training programmes. It shouldn’t surprise anyone that there is a lot of potential demand for training tools and services via mobile devices, and a lot of businesses are trying to fill it. One challenge is how to manage corporate training on personal phones and tablets. For all of the exhibitors talking about mobile, I saw nothing to suggest that there is an easy solution. I would suggest there were more Learning Management Systems, and they don’t appear to be focusing on the trends of three years ago, of social tools and gamification. A couple of people I spoke to were pleased to see the passing of the frenzy for badges with everything. I only noticed one company talking about another former buzzword, xAPI (aka Tin Can API), which appears to be successfully helping businesses track the success of training, for example, in retail stores. In 2015, I only noticed a handful of mentions of SharePoint or Office 365. By 2018, there were even fewer. I find it uncanny that a vast number of knowledge workers make use of SharePoint, but training isn’t being delivered to them on that platform. One I did find, was a company whose LMS tightly integrates with 365. This sent my mind racing around the potential and ease of setting up Teams for different learning cohorts, with associated file storage and such – this substantially raises the potential for team-based learning. It was also good to see the potential of SharePoint’s search and card-type previews actually in use. They’re also using a chatbot interface to speed access to courses – instead of hundred of courses with leadership somewhere in the description, they list the top 10 leadership courses. I’m told that younger employees are unlikely to search, but will query a bot. This challenge of finding the right training materials is central to the success of any service. At least one supplier of ebooks and other resources has tried to simplify that with integrations can be completed in as little as 15 minutes. Shorter, to-the-point, training materials can contribute a lot too, but perhaps you lose out on the big names. 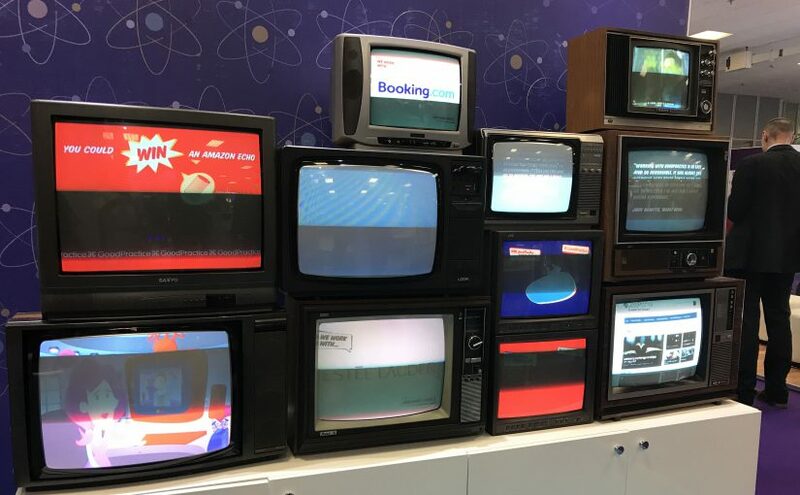 While I find it strange that the Learning Technologies exhibition has such a blind spot to intranets and SharePoint, I feel it is perfectly understandable. The primary customers are in HR or even in their own domain. There’s also a loose, but natural, affiliation between the the providers of training, and the systems that make it possible. To take things further into the realm of the digital workplace requires a lot more time, effort, and thought. There is no doubt in my mind that training tools and materials should be available from the front page of an intranet and throughout it. A commitment to learning is also good for communications and culture, it seems obvious that showing pride in the training materials can contribute to better employee attitudes and overall morale. However, even with the best materials and company leadership, an employee needs supportive management. For someone without a desk or a laptop, finding a quiet space and/or device may be a challenge in its own right. This may be too disruptive for management who only regard face-to-face training as “real training”. Conversely, managers may dislike the hassle of losing staff time to away-days with an uncertain gain. Consider the explosion in businesses offering video for use online. I’ve come to the view that we will see a similar demand and, therefore, provision of digital training. It will be up to HR and digital workplace professionals to ensure these materials are managed and curated in ways that lead to a better experience. If you’ve worked in a large organisation, you’re likely to have seen it drowning in courses, videos, ebooks and more. It doesn’t surprise me that training and other learning materials are poorly represented in the digital workplace: it’s not easy to do this well. That’s why it’s such an opportunity.